The North Sounder is designed to recover 90 percent of an oil spill at rates up to 500 gpm. Its on- board recovered oil capacity is 12,000 gallons. 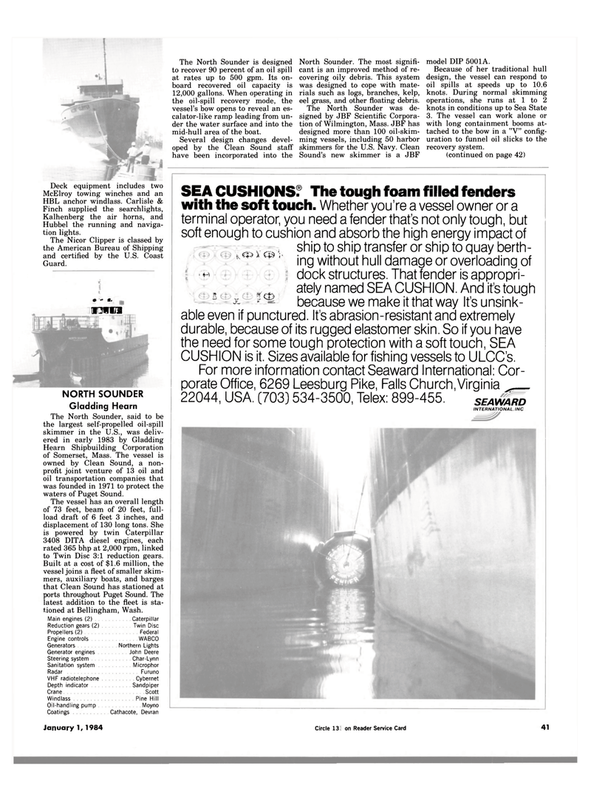 When operating in the oil-spill recovery mode, the vessel's bow opens to reveal an es- calator-like ramp leading from un- der the water surface and into the mid-hull area of the boat. North Sounder. The most signifi- cant is an improved method of re- covering oily debris. This system was designed to cope with mate- rials such as logs, branches, kelp, eel grass, and other floating debris. Sound's new skimmer is a JBF model DIP 5001A. Hubbel the running and naviga- tion lights. Hearn Shipbuilding Corporation of Somerset, Mass. The vessel is owned by Clean Sound, a non- profit joint venture of 13 oil and oil transportation companies that was founded in 1971 to protect the waters of Puget Sound. The vessel has an overall length of 73 feet, beam of 20 feet, full- load draft of 6 feet 3 inches, and displacement of 130 long tons. She is powered by twin Caterpillar 3408 DITA diesel engines, each rated 365 bhp at 2,000 rpm, linked to Twin Disc 3:1 reduction gears. Built at a cost of $1.6 million, the vessel joins a fleet of smaller skim- mers, auxiliary boats, and barges that Clean Sound has stationed at ports throughout Puget Sound. The latest addition to the fleet is sta- tioned at Bellingham, Wash. CUSHION is it. Sizes available for fishing vessels to ULCC's.